Any ideas if the portable browser plugin still works with v3.x? When I follow SYSTEM's extraction instructions above, I don't get npPdfViewer.dll but two other dlls, PdfFilter and PdfPreview. Without nPdfViewer the plugin does not work, with it opera:plugins (good ole Opera 12) says the plugin is still at v2.5.2, the version of said dll. SumatraPDF would be great if it didn't support DRM. It prevents you from copying or printing PDFs that are "protected", and the author refuses to make it optional. Hypocritical for Free Software to support DRM if you ask me. Actually, the installer of Sumatra PDF 2.3 can be extracted by running it with the /x command line switch. :) Extracting the installer requires admin rights, though. Download the installer. Extract it by running it with the /x command line switch. Exit the web browser and copy the files libmupdf.dll, npPdfViewer.dll, SumatraPDF.exe and optionally DroidSansFallback.ttf to the plugin directory of the browser. Finally, restart the browser. The plugin is ready for use. This version will once again run on older (non-SSE2) CPUs. Checkout the advanced settings: Settings - Advanced Options. The link for help with the settings is found at the top of the text file. The good - a new 'SumatraPDF-settings.txt' file. The bad - wont run on non-SSE2 processors. Re portable browser plugin: It seems that extracting the installer no longer works on v2.3. the background color persists (stored in sumatrapdfprefs.dat). So, the next time you start with sumatra.exe the background will be white. @Midas : Thanks for the hint! There are more parameters possible. See the manual. Finally I got rid of Adobe Reader and switched to Sumatra, the browser plugin works just as well. Unfortunately, version 1.7 no longer runs under WinXP-sp1 or Win2000. v1.5 has bulked up almost 2 megs! Whoa! @SYSTEM: I tried this version but you need npPdfViewer.dll and SumatraPDF.exe portable in the plugins dir: from 1.56K to 3.56K! Sadly, the GIF-bug still exists. (See my comment on 2011-03-13). Too bad, because I'm looking forward to replacing my Foxit with Sumatra!! First, download the INSTALLER and extract it with Universal Extractor ( http://www.portablefreeware.com/?id=641 ). When prompted, answer that the installer is not InstallShield. After that, exit the web browser and copy the files npPdfViewer.dll and SumatraPDF.exe to the plugin directory of the browser. Optionally you can copy DroidSansFallback.ttf as well. Finally, restart the browser and enjoy the plugin. I'm wondering whether it is possible to use the browser plugin with the portable version? @linuxx...Alot of people don't realize this. Thanks for posting the facts. The error i described on 2011-02-04 still exists. Too bad, because I really like this program, and look forward to the day I can replace my old Foxit with Sumatra. The error is: PDF's I make from B/W GIF's show up blank in Sumatra!! Jami, you can usually get an app directly from most developers. That will alleviate much of the exaggeration problem. 'They're so small' is the same argument often used to fill your system with tons of language files and the like. The direct plan would also soothe the 'just waiting for missed or lagging updates to become available' problems. Choice is good. @Jami Categorizing 230k as 'hefty' is an exaggeration to say the least, especially considering the majority of those files are source code and help files you can delete if you don't want em. Singularity@ - Good call! Takes you from 2 lone files up to 29 files & 11 folders. A hefty price to pay just to remember the last file viewed. Especially if you use lots of portable apps. @Singularity - You'll find that your recently opened files in Sumatra PDF's zip version will fail to open as you move PCs and your drive letter changes. The PortableApps.com release of Sumatra fixes that issue. And if you don't like it, you can disable the splash with a quick INI change. Tried Sumatra recently, and I really like it. But when I create a PDF file from black-and-white GIF files (2 colors) using eg. 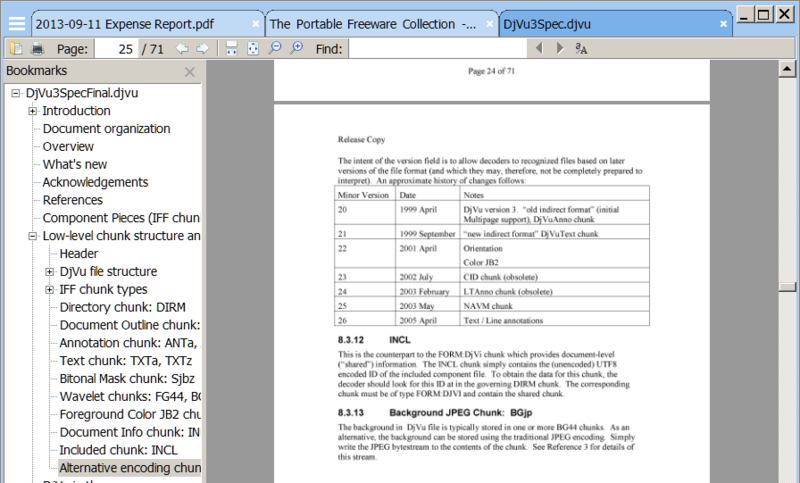 Faststone Viewer (using "Create/ Multipage file/ PDF"), they show up blank in Sumatra. Many apps around are already portable, or they usually have a zip counterpart without installer. I tell this to avoid you installing those so called "portable" versions, doing nothing more than loading useless spashscreen and adding space to your drive. The zip version of Sumatra pdf, downloaded from author page, it's many times faster then the other so called "portable" version you find on other websites like Portableapps and so on. Sumatra is great - about a million times faster than Adobe Reader plus, if you need to copy text from a document, you can bring it up in Adobe Reader in the same place in the document as Sumatra. I got Sumatra for the way it saves your place in a given PDF, stuck with it for it's speed, portability and size. Place it somewhere else and it should be ok! Is it just me or does SumatraPDF still store it settings Application Data folder? @dianoga. Sumatra 1.1 does not show comments added with PDF-XChange Viewer. I would like to see in the toolbar 2 icons: copy text and copy figure (As in Foxit Reader). I know this may be done by some keys(that sometimes I can't remember when more I need). Updated comment from me for version 1.0: I have no issues with this app anymore. It no longer writes settings outside the app folder, remembers viewing-settings correctly, doesn\\'t crash anymore here, and just basically does anything i\\'d want of a simple lightweight PDF-Viewer. Can Sumatra 0.9.3 show sticky notes and other annotations to the original PDF? For some reason they do not show up. Although it has simplicity and reliability on its side (have been using constantly for months), Foxit (http://www.portablefreeware.com/?id=1041) handles printing of dramatically better, has more features, and is more intuitive, though it is mild nagware. This would be a wonderful replacement for other PDF-Viewers, if it weren't that the app is missing one feature which almost any other app has by default: Remembering your viewing-settings. Well yes, 0.8.1 now remembers SOME of those settings, but still not all - for example, i want my PDFs to open in a maximized window, but sumatry wont remember that - it will always open files in a small window and i therefore always have to maximize the window manually. This may sound trivial, but its the kind of features which you normally dont notice anymore because you asume them to be normal - you only miss then when you get an app which lacks them. friendly. I'm so glad to be free of Adobe. I've haved Foxit in the past too, but I like this much better. Regarding some old posts above: The new version 0.8 is as fast as it probably can get - and supports searching, selecting and copying text to the clipboard (no "select all" function, though). It's a bit tricky to find, however: To mark text, left-click and drag while keeping CTRL pressed. It copies everything covered by the yellow area, regardless of words or lines, so you'll have to carefully avoid getting to close to characters you don't want to be copied. Also, when you paste the copied text, there's always a line-break at the end. (I don't know if this is a bug or intended behavior.) Quite rarely, search won't find text even though it's there. Other than that, everything works fine. It has never crashed for me, either. Fast, simple, usefull, but missing search option. A Word doc I converted to pdf with PDF995 crashes Sumatra if I open it from Explorer, but opens fine if I use Sumatra's menu File Open. Another larger doc converted the same way gives no problems at all. The problem doc when converted with OpenOffice gives no problems at all. Possibly something to do with using GhostScript in PDF995 ??? Hope they get the bugs out, its wonderfully small. If I put it in my Program Files folder, it'll create a SumatraPDF folder in My Documents and Settings folder. If I put it in My Documents folder it will not. nice and simple, wish it has basic features such as select, select all, copy, ect and a mdi interface or tabs or multiple viewing. i havent seen any other opensource, and really small pdf viewers.